Since ancient times, caravans have traveled via the Tea Horse Road between Lijiang in northern Yunnan and Kangding in southwest Sichuan. It has been an important trade route linking land-locked Sichuan and the border province of Yunnan. Caravans full of tea set off from Lijiang. After arriving at Kangding, wranglers load up their horses with Tibetan herbs, furs and game and then returned home. The length of this part of the Tea Horse Road is about 400 km long. In 1928, American Botanist Joseph Lock set off from Lijiang, passing through Muli and Yading before finally reaching Daocheng. His experiences were published in National Geographic, and this route thereafter was named "Road of Lock". Daocheng, located in the Sichuan province, is considered another Shangri-la hidden within the mountains of southwest China. Daocheng, subordinate to the Ganzi Tibetan Autonomous Prefecture, possesses unique geographical features and natural scenery. The area is enveloped by waterfalls, thick forests, snow-capped mountains, and, of course, further enrichened by the culture of the Tibetan people. The temperature in summer averages 24?Ã¯Â¿Â½Ã¯Â¿Â½ much cooler than that of nearby cities Chengdu or Kunming. There are 1,145 lakes scattered in an area of 3,200 square kilometers. The Yading Nature Reserve of Daocheng County is undoubtedly one of China's most awe-inspiring nature reserves. It is regarded as a sacred area by Tibetans. Every stunning vista here is celebrated with small traditional prayer flags or mani stones. Daochang is full of discovery, from Tibetan small towns reminiscent of the wild west, rolling landscapes plumed with wheat and barley fields, to the spectacular natural beauty of Yading Nature Reserve's snow-capped mountain peaks. 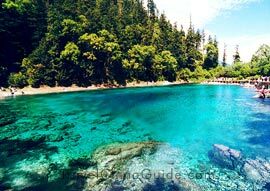 Hongchaodi (Red Glass Lake): A lovely lake fringed by red bushes, located half way between Sangdui and Daocheng. Rupuchaka Hot Springs: Four kilometers outside of Daocheng. Accessible by foot or taxi. In autumn of 2003, when water was in short supply at most hotels in Daocheng, travelers went to Rupuchaka for a hot-spring bath. A word of warning, however: Cockroaches are in abundance. Buddhist Tibetans do not bother to eliminate them, thus allowing them to be extremely active, even in your clothes and shoes. Bangpu Si: Built in the 12th century and located one kilometer north of Sangdui along the main road. Zhujie Si: South of Sangdui, 18 kilometers north of Daocheng. Xiongdeng Si: 10 kilometers northeast of Daocheng, at an elevation of 4105 meters. Gongling Si (Konkaling): Built in the 15th century and located 62km south of Daocheng along the road to Yading. 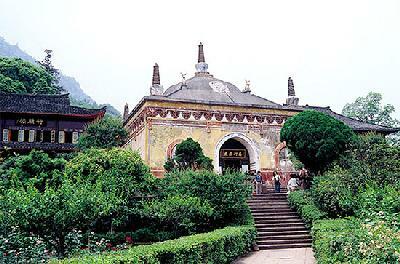 It is the biggest monastery in Daocheng. Rent a car either in Sangdui or Daocheng. Try to find other travelers to share the car. Another option, if you have time, is to walk to these sites (except Gongling Si). It can be a pleasant journey to discover these fabulous monasteries and hidden Tibetan villages by walking amidst pastoral scenery. 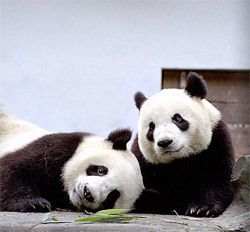 Itinerary 1: Chengdu (Alt. 500M) --> Kangding (2500M) --> Daocheng (3800M); Around 800 km; Minimum 2 days by bus or car. Take a bus heading for Kangding either from the Chengdu Tourist Transportation Center (Xinnanmen bus station) or the North Bus Station in the morning. Upon arriving at Kangding in the late afternoon, buy your ticket immediately for the Daocheng bus. Tickets can sell out quickly during the peak season. If time permits, you can stay at Kangding for one or two days. Visit Mugecuo Lake, Tagong Glassland, and adapt slowly to the altitude. Kangding to Daocheng: 12 hours by bus. Most travelers would feel the strong effect of high altitude if they come to Daocheng from Chengdu in two days. 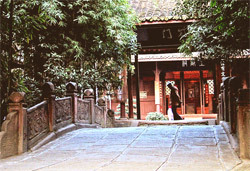 This is one of the most fabulous travel routes in China for independent travelers. If you adapt to Zhongdian's altitude, you will have no difficulty in Daocheng. The regular bus connecting Zhongdian to Daocheng (330km, 12 hours) zigzags through the awesome Shangri-La Gorge (ex-Birang Gorge). PLEASE NOTE, however, that this route is often cut off by landslides. First take a bus from Zhongdian to Derong, (5 hours) and then find a collective taxi to Xiangcheng (4 to 5 hours). Stay overnight in Xiangcheng and catch the morning bus for Sangdui (3.5 hours). Derong is located in a sheer gorge, 144km north of Zhongdian. Surrounded by sacred mountains, awesome gorges and high meadows, Derong is a nice place to discover a wild and pristine landscape. A daily bus leaves Zhongdian for Derong at 9:00am (5 hours). A bus leaves Derong once every two days for Kangding, passing through Xiangcheng, Sangdui and Litang. Xiangcheng nestles in a beautiful valley of terrace fields, dotted with traditional Tibetan farm houses and splendid monasteries. The surrounding landscape is more peaceful than that of in Derong. From Xiangcheng - Sangdui: take the daily Kangding bus. Check the departure time in advance as it is not the same every day. It takes three and a half hours for the bus to climb to the height of 4700M before descending back down to Sangdui (nearly 4000M). 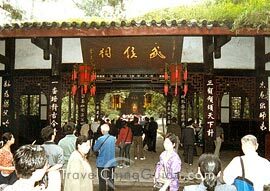 Xiangcheng is worth a visit. A day tour proposed by a guide at a local hotel includes visiting a Tibetan farm house in a nearby Tibetan village, hot springs, and the monastery located outside the town. Sangdui is a quiet, charming Tibetan village. Ugly modern buildings haven't crept into the town yet. Don't miss Bangpu monastery, 1km north of Sangdui, along the enchanting Daocheng River. Reasonable lodging can be found in Daocheng, about 28km from Sangdui. It's a pity if you return the same way you come. Try to go to Daocheng from Zhongdian and then quit Daocheng for Litang, Kangding and Chengdu. Daocheng has daily buses departing for Kangding. During peak season, a mini bus is added for Xingduqiao. Both buses pass through Litang, from where you can head west, starting your adventure in Tibet.